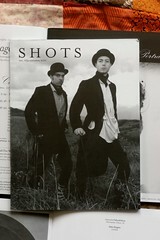 Two days ago the postman brought me a delightful surprise: I opened the envelope to find that an image from Two Gentlemen was on the cover of SHOTS magazine. Leafing through it I then found myself as the strongman in Heimischer Zirkus posed next to Ellen Rogers. What a delight indeed. I am intrigued by the fact that many of us portray ourselves in a different light to that by which our friends may see us. I am not the macho strongman, in the slightest, and I doubt if Ellen is the bold seductress that she presents. It is also curious, on another page, to see Ed Fox, dark and obscure, and as far removed from his colourful nudes as I could possibly imagine him. It is an honour to be in the magazine, it is our first magazine cover, and I am thrilled to be in such good company.